A police dog discovered what officers described as a “small retail shop for narcotics” in the man’s car, according to Largo police. LARGO – A Clearwater man was accused of 11 drug-related crimes after a police dog sniffed out narcotics during a traffic stop, the Largo Police Department said. Anderson Jermaine Daniels, 39, of Clearwater, was charged with one count each of Trafficking in Heroin, Trafficking in Fentanyl, Trafficking in MDMA, Possession of Crack Cocaine, Possession of Hydromorphone, Possession of Marijuana, Possession of THC, Possession of Oxycodone, Possession of Dextroamphetamine, and Possession of Buprenorphine. Largo police said an officer stopped Daniels on Wednesday (April 10 ) night for a traffic violation in the area of Missouri Avenue and Belleair Road. Police seized Daniels’ Nissan and $826. 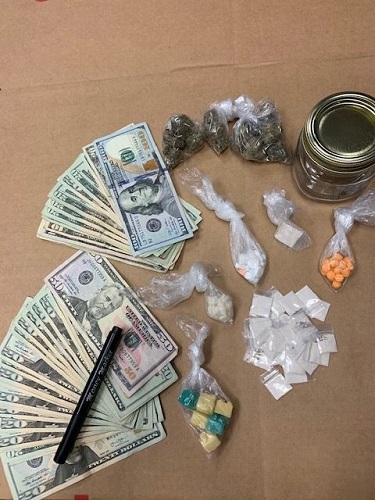 Photo of cash and drugs courtesy of the Largo Police Department. A police dog discovered what officers described as a "small retail shop for narcotics" in the man's car, according to Largo police.